From the obscurity of the German 5th Division to the heights of the Bundesliga the rise of Hoffenheim (or TSG 1899 Hoffenheim to give them their full name) has been rapid but much like the history of the club, not without controversy! Formed in 1945 as a local village amateur side the club was the amalgamation of 2 other teams - Turnverein Hoffenheim and Fußballverein Hoffenheim. It took them until 1996 to reach the lofty heights of the German 5th division and it is from there that their story diverts from the norm. At the turn of the new millenium Dietmar Hopp (a successful software tycoon) returned to his local team as a financial backer. The extra money coincided with a meteoric rise up the ranks of German football until Hoffenheim eventually reached the Bundesliga in 2008. As is sometimes the case new money is not always welcome money and there have been plenty of disenting voices over the rise of this village team to the Bundesliga, common complaints being a lack of history and low support base. People seem to forget that ALL teams have to start somewhere and no team has been given a god given right to success, it is success that brings a fan base and exposure, especially in our global world where fans are spread over every corner of the planet. 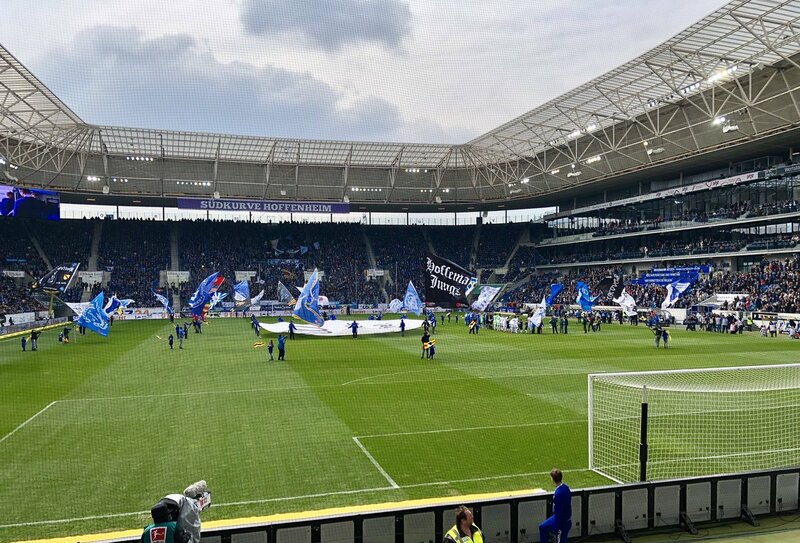 As it stands Hoffenheim now play out of the 30,000 seater Rhein-Neckar-Arena and are getting ever closer to being a consistent top half of the Bundesliga team. It is hoped that European football will follow on a regular basis as the team hopes to avoid any more brushes with relegation. An entertaining team to watch they are sure to gain more fans over the years and for certain their current followers are some of the most dedicated of any team in any league. 90'+5' - Thats all. Game finished - TSG 1899 Hoffenheim 2, Hertha Berlin 0. 90'+5' - Second Half ended - TSG 1899 Hoffenheim 2, Hertha Berlin 0. 90'+4' - Karim Rekik - Hertha Berlin - won a free kick in defence. 90'+2' - Shot blocked. Andrej Kramaric - TSG 1899 Hoffenheim - shot with right foot inside of six yard box - left side is blocked. Assist - Nico Schulz. 90'+1' - Ermin Bicakcic - TSG 1899 Hoffenheim - won a free kick in defence. 90' - New attacking attempt. Andrej Kramaric - TSG 1899 Hoffenheim - shot with the head from the centre of the box is saved by goalkeeper in the centre of the goal. Assist - Pavel Kaderábek. 88' - New attacking attempt. Nico Schulz - TSG 1899 Hoffenheim - shot with left foot from outside the box is saved by goalkeeper in the centre of the goal. Assist - Florian Grillitsch. 85' - Missed chance. Leonardo Bittencourt - TSG 1899 Hoffenheim - shot with right foot from the centre of the box is close, but missed after corner. 85' - Substitution - Hertha Berlin. Pascal Köpke for Davie Selke. 84' - Corner - TSG 1899 Hoffenheim. Conceded by Karim Rekik. 83' - Reiss Nelson - TSG 1899 Hoffenheim - won a free kick in defence. 83' - Maximilian Mittelstädt - Hertha Berlin - won a free kick in defence. 78' - VAR: Goal. Referee decision on field cancelled. 77' - Delay in match - TSG 1899 Hoffenheim Video Review. 77' - Substitution - TSG 1899 Hoffenheim. Leonardo Bittencourt for Kerem Demirbay. 76' - GOAL!!! TSG 1899 Hoffenheim 2, Hertha Berlin 0. Reiss Nelson - TSG 1899 Hoffenheim - shot with the head from the right side of the six yard box to the right corner. Assist - Nico Schulz with a cross. 75' - Corner - Hertha Berlin. Conceded by Oliver Baumann. 75' - New attacking attempt. Karim Rekik - Hertha Berlin - shot with left foot from the left side of the box is saved in the right corner. Assist - Mathew Leckie. 74' - Mathew Leckie - Hertha Berlin - won a free kick on the right wing. 73' - Missed chance. Benjamin Hübner - TSG 1899 Hoffenheim - shot with the head from the centre of the box goes high. Assist - Kerem Demirbay with a cross after corner. 73' - Corner - TSG 1899 Hoffenheim. Conceded by Rune Jarstein. 73' - New attacking attempt. Benjamin Hübner - TSG 1899 Hoffenheim - shot with the head from the centre of the box is saved in the left corner. Assist - Andrej Kramaric with a cross. 72' - Corner - TSG 1899 Hoffenheim. Conceded by Rune Jarstein. 72' - New attacking attempt. Pavel Kaderábek - TSG 1899 Hoffenheim - shot with the head from the right side of the six yard box is saved in the top centre of the goal. 72' - Corner - TSG 1899 Hoffenheim. Conceded by Davie Selke. 71' - Corner - TSG 1899 Hoffenheim. Conceded by Peter Pekarík. 71' - Pavel Kaderábek - TSG 1899 Hoffenheim - won a free kick in defence. 69' - Substitution - TSG 1899 Hoffenheim. Reiss Nelson for Nadiem Amiri. 69' - Missed chance. Maximilian Mittelstädt - Hertha Berlin - shot with left foot from outside the box is close, but missed to the left. 67' - Corner - Hertha Berlin. Conceded by Benjamin Hübner. 65' - Substitution - TSG 1899 Hoffenheim. Ermin Bicakcic for Ádám Szalai. 64' - Marvin Plattenhardt - Hertha Berlin - won a free kick in defence. 63' - Substitution - Hertha Berlin. Javairo Dilrosun for Valentino Lazaro. 60' - Missed chance. Valentino Lazaro - Hertha Berlin - shot with the head from the right side of the box missed. Assist - Maximilian Mittelstädt. 58' - Missed chance. Andrej Kramaric - TSG 1899 Hoffenheim - shot with right foot from outside the box is close, but missed to the left. Assist - Ádám Szalai. 57' - Ádám Szalai - TSG 1899 Hoffenheim - won a free kick in defence. 55' - Missed chance. Kerem Demirbay - TSG 1899 Hoffenheim - shot with right foot from outside the box goes high. 55' - Shot blocked. Andrej Kramaric - TSG 1899 Hoffenheim - shot with right foot from the centre of the box is blocked. Assist - Nadiem Amiri. 54' - Missed chance. Kerem Demirbay - TSG 1899 Hoffenheim - shot with right foot from outside the box is close, but missed. Assist - Nico Schulz. 50' - Corner - Hertha Berlin. Conceded by Benjamin Hübner. 47' - Florian Grillitsch - TSG 1899 Hoffenheim - won a free kick in defence. 47' - Missed chance. Nadiem Amiri - TSG 1899 Hoffenheim - shot with right foot from outside the box is close, but missed. Assist - Andrej Kramaric. 46' - Nadiem Amiri - TSG 1899 Hoffenheim - won a free kick in attack. 45' - Second Half starts TSG 1899 Hoffenheim 1, Hertha Berlin 0. 45'+1' - First Half ended - TSG 1899 Hoffenheim 1, Hertha Berlin 0. 43' - Shot blocked. Nadiem Amiri - TSG 1899 Hoffenheim - shot with right foot from outside the box is blocked. Assist - Andrej Kramaric. 42' - Corner - TSG 1899 Hoffenheim. Conceded by Marvin Plattenhardt. 41' - Andrej Kramaric - TSG 1899 Hoffenheim - won a free kick in defence. 40' - Salomon Kalou - Hertha Berlin - won a free kick in defence. 39' - Corner - TSG 1899 Hoffenheim. Conceded by Marvin Plattenhardt. 37' - Offside - Hertha Berlin. Valentino Lazaro with a pass, however Davie Selke is in offside. 35' - New attacking attempt. Marvin Plattenhardt - Hertha Berlin - shot with left foot from outside the box is saved in the left corner. 34' - Kerem Demirbay - TSG 1899 Hoffenheim - receive yellow card for a foul. 34' - Davie Selke - Hertha Berlin - won a free kick in attack. 33' - Missed chance. Maximilian Mittelstädt - Hertha Berlin - shot with left foot from the left side of the box is close, but missed to the left. Assist - Salomon Kalou. 32' - Benjamin Hübner - TSG 1899 Hoffenheim - won a free kick in defence. 31' - Valentino Lazaro - Hertha Berlin - won a free kick in defence. 31' - Ádám Szalai - TSG 1899 Hoffenheim - won a free kick in attack. 29' - GOAL!!! TSG 1899 Hoffenheim 1, Hertha Berlin 0. Nadiem Amiri - TSG 1899 Hoffenheim - shot with right foot from outside the box to the left corner. Assist - Kerem Demirbay. 29' - Corner - TSG 1899 Hoffenheim. Conceded by Karim Rekik. 28' - Ádám Szalai - TSG 1899 Hoffenheim - won a free kick in defence. 26' - Missed chance. Kerem Demirbay - TSG 1899 Hoffenheim - shot with left foot from the centre of the box is close, but missed to the left. Assist - Andrej Kramaric with a cross . 25' - Pavel Kaderábek - TSG 1899 Hoffenheim - won a free kick on the right wing. 24' - Missed chance. Ádám Szalai - TSG 1899 Hoffenheim - header inside of six yard box - left side missed to the left. Assist - Andrej Kramaric . 24' - Missed chance. Andrej Kramaric - TSG 1899 Hoffenheim - shot with the head from the centre of the box missed to the left. Assist - Kerem Demirbay . 23' - Ishak Belfodil - TSG 1899 Hoffenheim - won a free kick on the left wing. 22' - Offside - TSG 1899 Hoffenheim. Kerem Demirbay with a pass, however Ádám Szalai is in offside. 22' - Nadiem Amiri - TSG 1899 Hoffenheim - won a free kick in attack. 20' - Florian Grillitsch - TSG 1899 Hoffenheim - won a free kick in defence. 20' - Mathew Leckie - Hertha Berlin - won a free kick in defence. 19' - Florian Grillitsch - TSG 1899 Hoffenheim - won a free kick in defence. 18' - Missed chance. Ishak Belfodil - TSG 1899 Hoffenheim - shot with right foot from the left side of the box is high and wide to the right. 17' - Missed chance. Andrej Kramaric - TSG 1899 Hoffenheim - shot with the head from the centre of the box missed to the left. Assist - Nadiem Amiri. 15' - Missed chance. Andrej Kramaric - TSG 1899 Hoffenheim - shot with right foot from outside the box is high and wide to the right. Assist - Ádám Szalai. 14' - Pavel Kaderábek - TSG 1899 Hoffenheim - won a free kick in defence. 13' - Missed chance. Andrej Kramaric - TSG 1899 Hoffenheim - shot with the head from few metres is close, but missed to the left. Assist - Pavel Kaderábek with a head after corner. 12' - Corner - TSG 1899 Hoffenheim. Conceded by Maximilian Mittelstädt. 10' - Shot blocked. Andrej Kramaric - TSG 1899 Hoffenheim - shot with right foot from the centre of the box is blocked. Assist - Ishak Belfodil. 8' - Missed chance. Ádám Szalai - TSG 1899 Hoffenheim - shot with the head from the centre of the box is close, but missed. Assist - Nico Schulz with a cross. 7' - Shot blocked. Ádám Szalai - TSG 1899 Hoffenheim - shot with right foot from the centre of the box is blocked. Assist - Andrej Kramaric. 7' - Andrej Kramaric - TSG 1899 Hoffenheim - hits the left post with a shot with left foot from the left side of the box. Assist - Pavel Kaderábek with a cross. 7' - New attacking attempt. Nadiem Amiri - TSG 1899 Hoffenheim - shot with right foot from the centre of the box is saved by goalkeeper in the centre of the goal. Assist - Pavel Kaderábek. 5' - Ádám Szalai - TSG 1899 Hoffenheim - hits the bar with a shot with right foot from the centre of the box. Assist - Pavel Kaderábek. 3' - Shot blocked. Ádám Szalai - TSG 1899 Hoffenheim - shot with right foot from the centre of the box is blocked. Assist - Nadiem Amiri.